The Japanese school year starts in April, and this is the best time for us to recruit new scouts. We create leaflets and circulate to near-by primary schools. The best way to introduce our activities to each child is to have him/her try out as a member of the corresponding troop by age group. 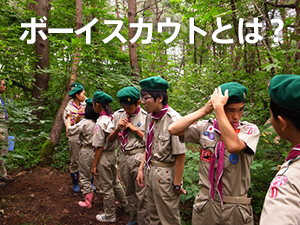 So, we have “Troop 1 Meguro Open Troop Fun Day” for scout candidates. All the troop members from Beaver Scouts, Cub Scouts, Boy Scouts, to Venture Scouts, and many Scouts’ parents were here to support this Open Troop Fun Day. Kevin, who leads our sister Troop 12 in Richmond, Canada also participated and gave a speech to our Scouts in Japanese. All of the troops and candidates listened to his speech very carefully. You really feel that Scout activity is international and we are part of it! Of course, in return, Troop 1 Meguro President Takane made a speech in English to our troops. Parents’ support of Scout activities is indispensable. We have 23 Scout candidates to this day, and that success was brought about by parents who went around to primary schools to hand in promotion leaflets as well as parents who participated on the day helping onsite registration desks and giving guidance to each candidate’s parent(s) from his/her own experience of scout activities. Each Troop also had its role in the event. Boy Scouts stayed overnight and prepared pancakes for Scout candidates and parents. Venture Scouts made a communication tower which was started in the very early morning on that day for the scout game. We had a good Open Troop Day. Hope all candidates who came to visit on the day will join us and bring their friends, too. We continue to promote Troop 1 Meguro to schools and pre-schools in the neighborhood.